For those of you who have been on a diet before can definitely understand how hard it is to eat out. You have to question everything that goes into the dish, including that things were cooked in, or whether they have found a way to sneak in sugar or fat somewhere you would least expect it. One the easiest things for me to eat out while on the Whole 30 was a burger, oddly enough. Of course I became that annoying customer who had to modify just about everything, but I had ordering burgers down to a science ("I'll have the Classic Burger, no bun, no condiments, and can I add avocado on top?"). Then one day the most magical thing happened - I discovered the burger bowl! One of our favorite burger spots in town actually makes a deconstructed burger in a giant bowl. It was amazing! It was pretty much made for anyone who is eating Paleo. It didn't have any condiments or dressing and I didn't have to change anything on my order ("One burger bowl, please!"). It felt so good not to be the high maintenance customer again. I knew I had to add this to my list of Whole 30 meals! 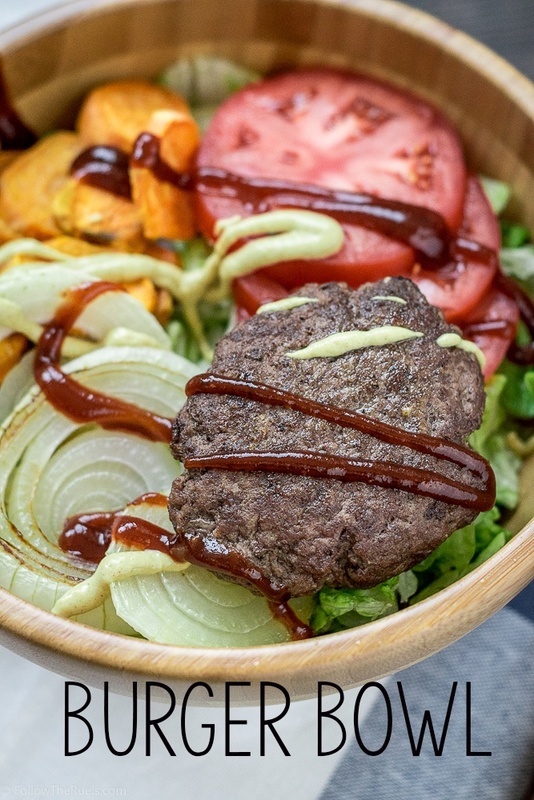 The burger bowl is incredibly easy to put together. I start with a bed of romaine lettuce that I tossed in lemon juice and olive oil. I then added some thick slices of tomato, grilled onions, and some roasted sweet potatoes (to add that french fry element). Then I topped it all with a 4 ounce burger patty that is simply seasoned with salt and pepper. I actually topped this off with some condiments because I had to cut this round of Whole 30 short thanks to an ill-timed case of food poisoning. I wanted to add just a little bit more flavor (and color) to the bowl, but its not like it really needed it. And just like the burger bowl at Bang Bang burger, this one totally hit the spot! It satisfied that craving for a juicy burger without that pesky bun. Who needs a bun anyways? Also place onion slices on grill or skillet to caramelize. Cook for 2-3 minutes on each side. Portion out the romaine into two bowls. Mix together the lemon juice and olive oil, and dress the lettuce. Top with the tomato slices, sweet potato, and onion.